QUITO, Ecuador–Ecuadorian flag carrier TAME has informed that in April, it will start Quito-Fort Lauderdale-Quito flights. This will be the second U.S. gateway for TAME (the airline already operates to New York-JFK). Fernando Guerrero, the General Manager of the airline is revamping its schedule, hoping to convert Quito’s Mariscal Sucre International Airport in a connecting hub. The flights from Sao Paulo, Buenos Aires and Lima will easily connect in Quito to New York-JFK, Fort Lauderdale and Havana, Cuba. The airline also analyzes if to suspend its flights to Panama City’s Tocumen International Airport for six months as load factors are around 50%. Also TAME has a code sharing agreement with the Panamanian airline COPA Airlines. Guerrero is planning to adjust TAME’s actual structure to the growth the airline has had in the last years, becoming the most important carrier of the country. At the moment more international routes are just in planning analysis like Quito-San Jose, Costa Rica. Last May Avianca’s TACA Airlines suspended its operations connecting the Ecuadorian capital with San Jose opening the opportunity for TAME’s operation to the Costa Rican capital. TAME of Ecuador will start flights between Quito and Fort Lauderdale in April. This entry was posted in Airlines, Costa Rica, Ecuador, Latin American Airlines, Latin American Airports, Panama, Peru, Quito, South American Airports, TACA and tagged Buenos Aires, Fort Lauderdale, Havana, New York-JFK, Panama City, Quito, Sao Paulo, TAME. 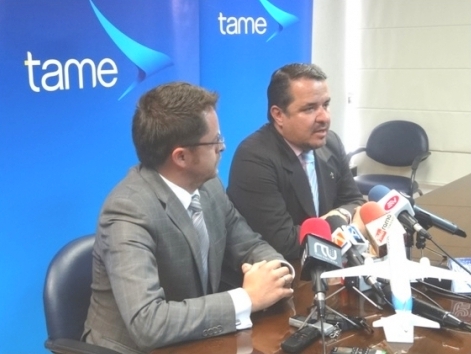 QUITO, Ecuador–TAME’s General Manager Fernando Guerrero informed on January 23rd the Ecuadorian flag carrier suspended temporarily its scheduled flights from Quito to Caracas. The reason for the suspension of services comes as a result of the problems the airlines are having in Venezuela, securing their sales earnings to be transferred by the Central Bank of Venezuela’s CADIVI Department (Comision de Administracion de Divisas) the government’s control center of foreign currency. Since April 2013 the CADIVI has not transferred the funds to TAME, an amount of $43,174,603. Fernando Guerrero also informed as soon CADIVI transfers the funds, TAME will reinstate the flights to Caracas. 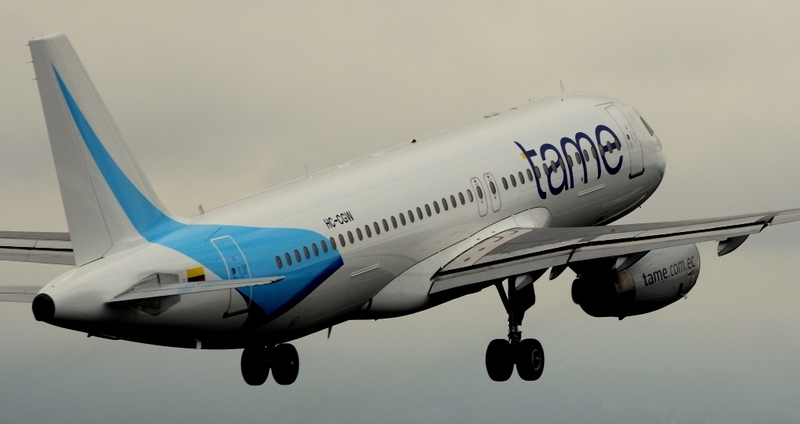 TAME suspended scheduled flights between Quito and Caracas. This entry was posted in Airlines, Caracas, Ecuador, Latin American Airlines, Latin American Airports, Latin American Flag Carriers and tagged CADIVI, Caracas, Quito, TAME. A TAME Airbus A-320 arriving at the new Quito/Tababela International Airport. QUITO, Ecuador. 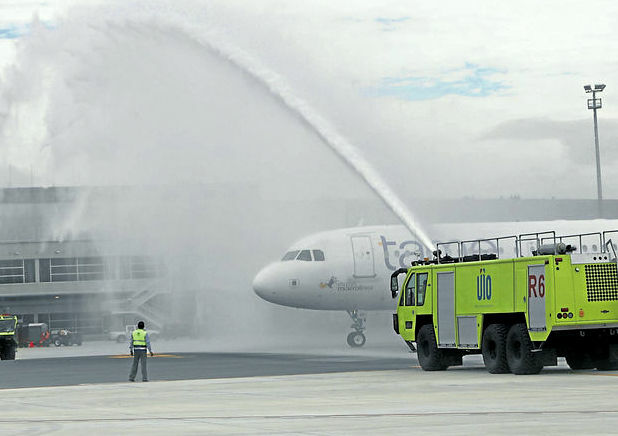 — On February 22nd the Civil Aviation Authorities (DGAC) of Ecuador opened the Quito International Airport at Tababela. The official name of the airport is Mariscal Sucre and was constructed as the old Quito International Airport inside the capital city was considered as one of the most dangerous airports in Latin America. Tababela is located almost an hour and thirty minutes away from downtown Quito. The airport has five jetways and a modern state-of-the-art control tower. 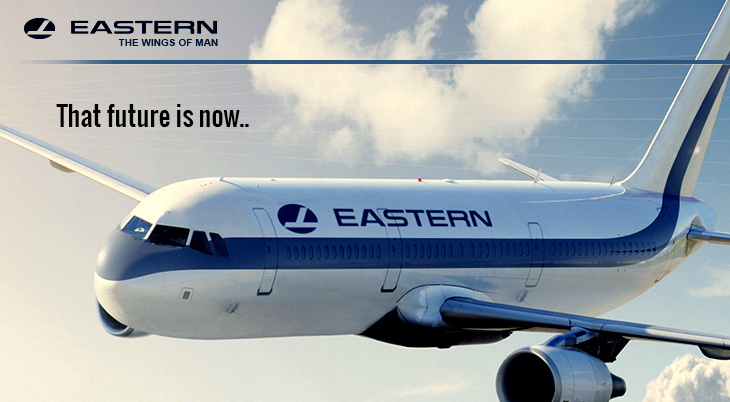 The arrival of a TAME Airbus A-320 in the morning opened Tababela for business. This entry was posted in Ecuador, Latin American Airports, Quito and tagged Mariscal Sucre International Airport, Quito, Tababela, TAME.